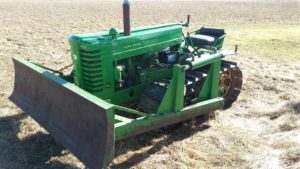 Last fall the HAHClub had the opportunity to purchase a John Deere model MC crawler ser#19302. Year 1952. These are quite rare , the few that are left! This model was the first crawler built by John Deere, before this ,they sent the Lindeman Co., tractors and Lindeman outfitted them with the crawler tracks. John Deere saw an opportunity with this piece of equipment so purchased the company and started producing the MC crawler. 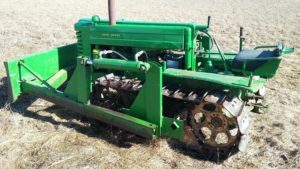 John Deere’s first own crawler.The machine had not been running for many years but after sanding the points and cleaning the carburetor, its was up and running. The amazing part was the clutch worked and so did the steering clutches. It also had oil pressure and was charging. It has a nice homemade front blade. The crawler still needs some TLC but it is a nice acquisition to the AMC. Thanks EARL for the wrok you have done and spotting this great fined.